Long-range air power and integrated air defence have long served as two powerful force multipliers in developing a balanced continental defence and ‘Australia Forward’ focused force structure. Further enhancing Australia’s ability to employ a balanced defensive and interventionist doctrine is the growing capability of Australia’s elite special operations forces, which have established themselves as modern day Spartans. In the years following the end of the Second World War, long-range air power in the form of the Canberra and later the F-111 bombers served as critical components in the nation's air power arsenal. The long-range tactical and strategic deterrence capabilities of such platforms, combined with the qualitative edge of Australian personnel and technological advantages of these platforms ensured Australia unrestricted air dominance against all but the largest peer competitors. However, the increasing proliferation of advanced and highly capable air combat capabilities throughout the region, driven largely by the cost effectiveness of Russian and Chinese air combat platforms is reshaping the role air power and integrated air defence plays in balancing both a continental defence and 'Australia Forward' defence posture and force structure. This has been exacerbated by the retirement of the F-111 platform in the early-2010s without replacement and further limited by the troubled capability and availability of the Navy's Collins Class submarines, which serve as the sea-borne leg of the nation's strategic deterrence force. Further compounding these tactical and strategic realities is the growing proliferation of advanced ballistic and cruise missile based threats, which pose significant threats to the nation's deployed forces and continental Australia. Finally, the growing threat of hybrid warfare driven by religious extremist organisations, organised criminal organisations and conventional peer competitors has highlighted the importance of building and enhancing the capability of Australia's world renown special operations forces, which have sharpened their skill sets in continuous deployments in Afghanistan and Iraq. Australia's special operations serve as the nation's clandestine, apex predators capable of answering the call at a moments notice, paving the way for larger conventional forces to slug it out with an enemy or providing highly-specialised combat capabilities to support the defence of the national interest. As the regional power paradigm continues to evolve, both the Air Force and Special Operations Command will serve critical roles in protecting mainland Australia and expanding the nation's regional role as part of an 'Australia Forward' doctrine. Australia's contribution the air combat campaign against the Islamic State in Syria and part of Iraq, using capabilities including the E-7A Wedgetail Airborne Early Warning and Control (AEW&C), KC-30A air-to-air refuelling tankers, classic F/A-18 Hornets and the Royal Australian Air Force's new F/A-18F Super Hornets and E/A-18G Growlers, proved to be a highly successful model for international air forces to draw upon for deployable, modular force structure packages. The air transportable nature of the F-35's support infrastructure, including the Varley-designed and manufactured deployable cabins and ALIS logistics system, combined with recent demonstrations of the expeditionary capability of the F-35 serve as a model for developing an air combat force capable of both continental defence and rapid response, power projection deployability. An example of such a tactical wing could incorporate a wing of four-to-six F-35As and four-to-six EA-18G Growler electronic attack aircraft supported by a KC-30A air-to-air refuelling tanker, an E-7A Wedgetail AEWC aircraft and a C-17 Globemaster to provide air mobility for supporting aircrew and material resources. Additionally, increased numbers of key air lift platforms like the C-17 Globemaster, C-130J Super Hercules and C-27J Spartan are all critical to supporting the broader Australian Defence Force's expeditionary capabilities with a focus on rapidly deploying Army Brigade Combat Team (BCT) units to support amphibious operations and manoeuvre warfare operations against peer competitors. While these next-generation platforms provide a quantum leap in the capability for the Air Force, Australia's habit of replacing platforms in a like-for-like capacity fails to recognise the role the nation will play in the region, limiting the capability of the Air Force to pre-position power projection and forward deployed force elements. Accordingly, Australia's acquisition of key force multiplying platforms should increase. While the acquisition of the Super Hornets in the mid-to-late 2000s served as a partial stop-gap for that lost capability, the nation has not successfully replaced the capability gap left by the F-111, limiting Australia's ability to act as a tactical and strategic offshore balancing power against acts of coercion and aggression. Australia has recently been gifted with the perfect opportunity to respond to this long-range strike gap in the form of the joint Defence Science and Technology and Boeing development of the 'loyal wingman' concept, which when combined with the successful platform and technology demonstrators in the Reaper series and MQ-4C Triton paves the way for developing a fleet of long-range, unmanned, low observable strike aircraft with a payload capacity similar to, or indeed greater than, the approximately 15-tonne payload of the retired F-111. Long-range strike serves as the 'thrust' component of the broader force structure adjustment. The growing prominence of cruise and ballistic missile-based threats has resulted in the Australian government outlining the need for a layered, integrated air and missile defence (IAMD) system as part of the AIR 6500 program. This program provides opportunities for the nation to develop a leading-edge battlespace management and IAMD capability, while also incorporating lessons learned as a result of China's successful introduction of anti-access/area denial (A2AD) systems to establish a virtually impregnable wall of steel throughout the 'sea/air' gap providing Australia with the opportunity to more actively and assertively engage with Indo-Pacific Asia. Australia's special operations forces are widely recognised as some of the most lethal and capable forces in the world. 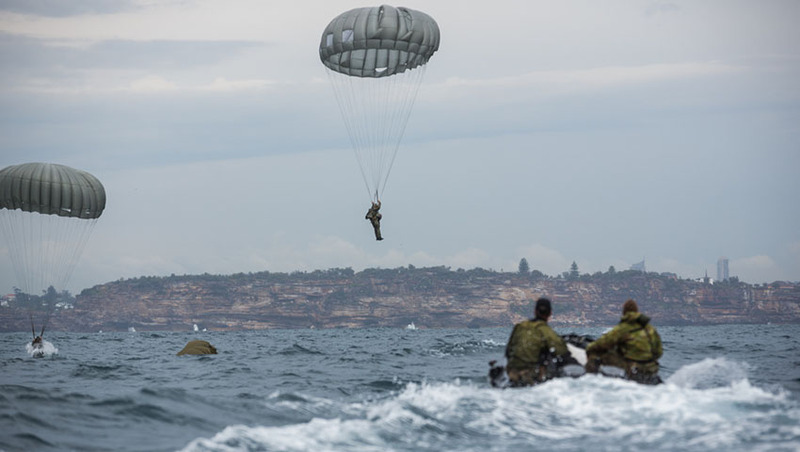 Combining gruelling training, next-generation technology and a uniquely Australian "never say die" attitude, the SASR, Commando Regiments, Clearance Diving Teams and the Air Force's Close Combat Controllers serve a unique role within the broader ADF force structure. Establishing Special Operations Command (SOCOMD) as its own standalone branch of the ADF with the introduction of a special operations aviation wing, in a similar vein to the US Army's 160th Special Operations Aviation Regiment or the US Air Force Special Operations Command, to provide dedicated close air support, strategic air lift and related capabilities without hindering the broader direct action capability and air mobility of the Army, Navy or Air Force. Empowering SOCOMD as its own branch of the ADF enhances the tactical and strategic options available to Australia's decision makers enabling further discretion and consideration when electing to deploy Australian 'hard power' in the region.